Datamax-O'Neil's I-Class revolutionized the barcode printer industry with its award winning modular design, field installable options and rugged reliability. For the past several years, resellers have named the I-Class the 'best channel product'� in some of the industry's largest third-party surveys. Now we've raised the bar even higher, with the redesigned I-Class Mark II. 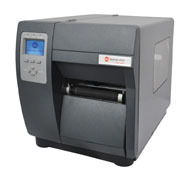 Versatile I-Class Mark II printers can be used in a wide variety of industrial applications with a range of media compatibility, connectivity, emulation support, and options. I-Class Mark II offers a complete range of printers with 203, 300, and 600 dpi models with the best value proposition for mid range industrial class printers. Increased productivity -- I-Class Mark II easily keeps up with high speed label demand applications, boasting 20% faster performance than the nearest competitor in its class. With a 400 MHz processor, the throughput of the printer is fastest in the mid range industrial printers in the industry. Its modular design facilitates adding and/or changing options with ease, making it easy to upgrade and reconfigure for business growth. The I-Class Mark II has drivers for use on the latest Windows operating systems. The drivers allow the user to view and change printer settings from any Windows software application, simplifying the print process. Windows drivers are available on the CD included with the printer or can be downloaded at www.datamax-oneil.com.